There are a lot of things happening this week that have me very excited! First, I will be going to Cumberland Island on Tuesday with a few other science teachers to study erosion on the barrier island. On Friday, Mr. Brandon and myself will fly to Washington DC to attend a science conference. You will have a substitute teacher on Tuesday and Friday, and I am expecting exceptional grace and courtesy reports. I'll be sure to take a lot of pictures and put them on the blog so you can share what I am seeing on Cumberland Island and in DC! This week at Ellis we will continue to study surface area of cylinders in math. As you know, the more we practice a concept, the better we will get at it. I have a feeling we will all be surface area experts by the end of this year! Be expecting some math homework and a quiz on Thursday. I've notice a lot of people using Ten Marks to help practice their math work! This is WONDERFUL! Keep it up! Apparent Magnitude- the brightness of a celestial body as seen from earth. 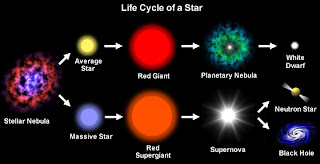 The lower the number, the brighter the planet or star. Let's get this week going!